Germany took a hard line with Greece this summer as much out of fear of political as economic contagion. Even if wiping out Greek debts were easily affordable, it would quickly have become prohibitively expensive when voters in Portugal, Italy and Spain demanded the same deal. 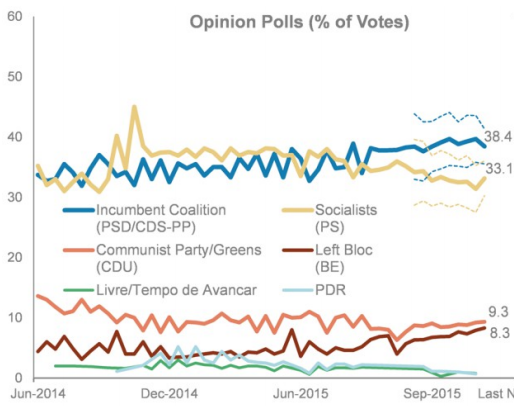 The Portuguese elections are tomorrow (Sunday), and will provide an indication of whether the German strategy worked. This has been a bad year for psephology, but that said the available poll data (courtesy of the Telegraph) suggests that the lesson of Greece has not been lost on Portuguese voters. When the Greek drama began in June, Prime Minister Pedro Passos Coelho belt-tightening government was in parlous political shape. Only around 30% of the country supported the government, and the Socialists were drawing support by demanding a surge in government spending in defiance of the Lords of the Eurozone. As the Greeks have been brought publicly to heel over the past few months, Portuguese voters have apparently taken notice. The Socialists have faded enough to give the government a reasonable shot at holding power.